In December 2007, Stephen Grey, a Sunday Times reporter, was under fire in Afghanistan as British and US forces struggled to liberate the Taliban stronghold of Musa Qala. Taking shelter behind an American armoured Humvee, Grey turned his head to witness scenes of carnage. A car and a truck were riddled with gunfire. Their occupants, including several children, had died. Taliban positions were pounded by bullets and bombs dropped on their compounds. A day later, as the operation continued, a mine exploded just yards from Grey, killing a British soldier.Who, he wondered in the days that followed, was responsible for the bloodshed? And what purpose did it serve? 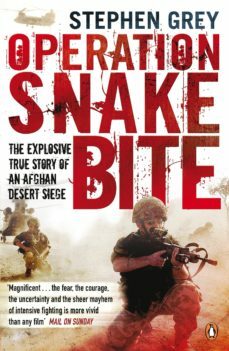 A compelling story of one military venture that lasted several days, Operation Snakebite draws on Greys exclusive interviews with everyone from private soldiers to NATO commanders. The result is a thrilling and at times horrifying story of a war which has gone largely unnoticed back home.